I am replacing the old standard TV in my RV. Is it best to go with a Plasma or LCD TV? I remember reading somewhere that altitude changes and temperature swings were not good for plasma TVs. Is it okay to use either a plasma or LCD while the RV is being driven? Thank you. What you have heard about Plasma TVs being affected by altitude is correct. A plasma TV screen is comprised of tiny little chambers containing compressed gasses such as Argon, Neon and Xenon. When you turn on your TV these gasses create the colors that you see on the TV screen. When you are above the 6000 foot level; the pressure changes in these chambers cause the Plasma TV to work harder to excite (activate) these gasses to create a picture. In fact, you can actually hear a buzzing sound from the screen, just like the buzzing you can hear when you stand close to a large neon sign. Because the TV components are working harder to produce a picture, it also shortens the life-span of the Plasma TV. The Liquid Crystal Screens on an LCD TV are not affected by altitude. That is why the airlines use LCD TVs for their in-flight entertainment. LCD screens have been used for TVs, Lap Top Computers, Outdoor Electrical Equipment, etc. for years because of their durability. Plasma TVs are usually heavier than LCD TVs and their glass screens are far more fragile than the screens on LCD TVs. generation of Plasma TVs last just as long as LCD TVs. The average lifespan of both TVs should average out to about 60,000 hours. That means if you watched TV for 8 hours every day, these TVs could theoretically last 20 years. One other disadvantage of a Plasma TV is picture burn-in. If you leave a static image on the screen for too long it could permanently leave that image on the screen. But the newer generations of Plasmas have gotten better at preventing picture burn-in. LCD TVs are much less prone to burn-in. So, if you have children or grand children that love to play video games and pause their games for hours on end, then you are better off with an LCD TV. Let's address picture quality. Videophiles swear that Plasma TVs have a superior picture quality. To be honest, the only time I have noticed a better picture quality on a Plasma versus an LCD TV is on TVs that have screens 50 inches or larger. The same thing holds true for the resolution of the TVs. Whether you get a 720p or 1080p LCD TV, you will not notice a difference between the two resolutions until you get into the 50" and larger screens. Now, to your last question can you use the TVs while going down the road? Yes, you can as long as you have a generator running or are using an Inverter to provide 120 volt power to the TV, you can watch DVDs, play video games or watch satellite TV (if you have a self tracking satellite dish on the roof of your RV). I hope this information has been helpful to you. If our visitors would like to add their own suggestions they can do so by clicking on the Click Here To Add Comments link at the bottom of this page. Comments for Should I Put A Plasma or LCD TV In My RV? Plasma technology is on its way out the door, primarily because the major manufacturer of plasma TV is scaling back (recently announced). LED TV is the current route to take since it has lower power consumption than LCD TV. What about the new LED's, where do they come in on this discussion? 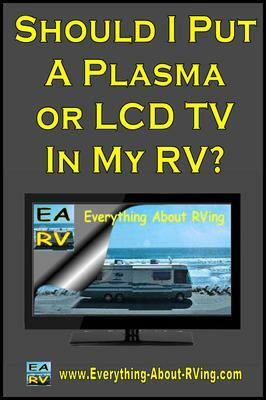 Note from RVing Al: An LED TV would work just as well as an LCD TV in an RV.